Farmington Square Salem cordially invites you to our Mother’s Day Lunch! Above all the rest, Moms are the best! 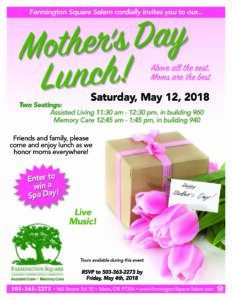 Friends and family, please come and enjoy lunch as we honor moms everywhere! Enter to win a spa day and enjoy live music! Tours available during this event.